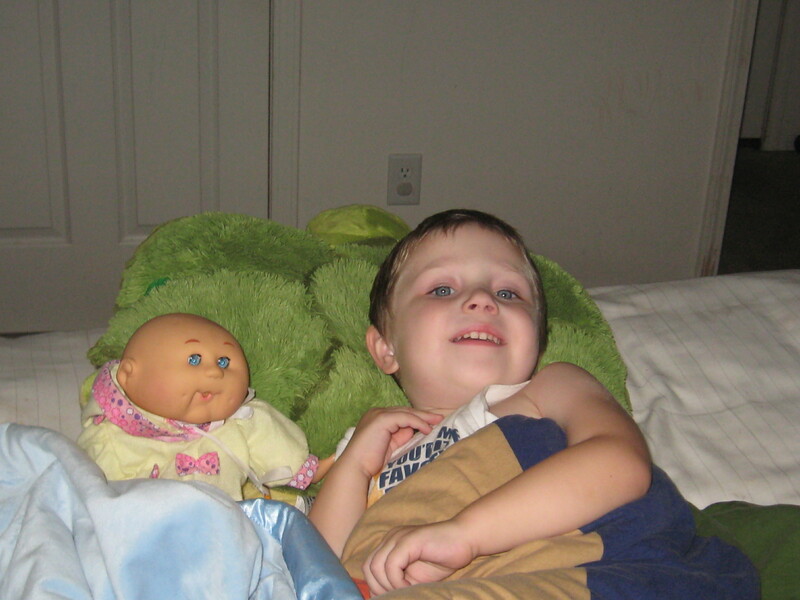 The phenomenon of the boys and this baby doll is a recent thing. It has only occurred after my brothers began spending time with my best friends new born infant son. Joey likes to “practice” holding the baby so he can hold Baby Ryan and his soon to be born cousin Baby Bella. He also practices how to feed the baby and give it a paci when it cries. He has named the baby “Will” after his brother. For Will, he wants to imitate his big brother and he needs to practice being gentle around babies for sure! I am raising children. Some day, my boys may very likely become fathers. I want to raise them to be good Daddys. I don’t want them to fear their children when they are newborns. I want them to approach the task with some kind of confidence. I want them to understand that sometimes we make mistakes, but our love is never a mistake. I want them to be able to support a wife who has difficulty breastfeeding and be able to comfort a crying child. We forget these things are not necessarily traits we are born with. I’ve watched many a father struggle and wish they could have just observed their dads doing some of the parenting things they find themselves doing, let alone been encouraged to do them themselves. Parenting is a very difficult task. One that no matter how many books you read you can never fully master. I’ve chosen to try to expose my children to learning through doing. And right now, my sons seem to be proponents of attachment parenting (we say Joey is co-sleeping in the picture above). Will they continue as adults? Who knows, there is a lot of time between now and then…in the mean time I hope and pray that I am raising daddys who will rise to the task of fathering their children in the best ways possible. 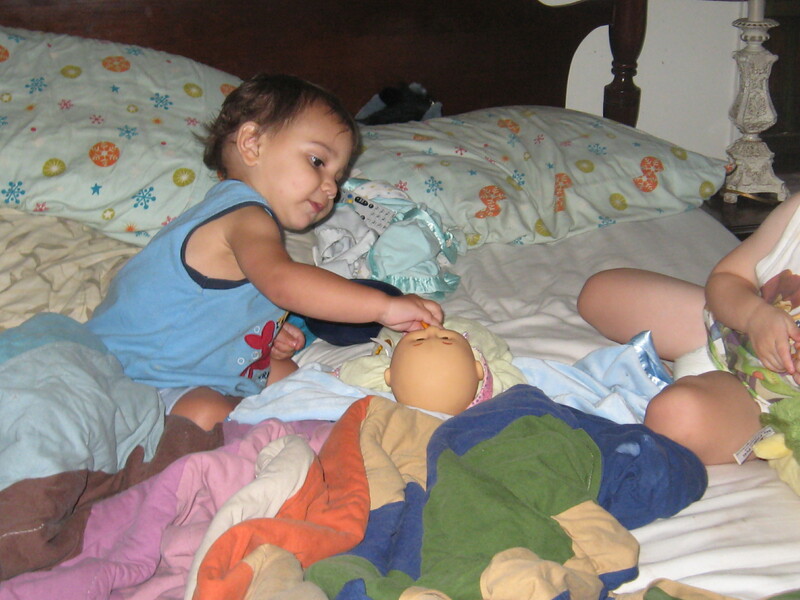 I love this Kristen, and see absolutely nothing wrong with boys playing with baby dolls. It’s a great way to teach them how to act around babies. And I just think all the hysteria people have around boys playing with dolls is silly. My daughter seems to really enjoy playing with cars and when we get together with two of my friends that have slightly older children, two boys and a girl between them, the little girl is always frustrated because my girl would rather play cars with the boys than do girly stuff with her LOL! Granted, she loves her babies too, but we’ve gotten her a few little toy cars to play with at home since she loves them so much! This is beautiful! You should be so proud your boys are so loving! And, because it bugs me when people say things to me about parenting, I hope you link to your blog post on FB so everyone can read how you are a wonderful mother, and how your boys are on their way to becoming REAL men! blessings! My boys used to walk around with dolls, they have been destroyed since then (cause they are boys) and now play daddy and mommy to several stuffed animals. They name them, and tell people to hush cause they are sleeping. They do need to learn how to take care of “babies”, but I just don’t allow them to take them into stores. In the truck is fine, swingset is fine. Just don’t want to explain to my boys, who are all boys..bumps and bruises, that people talk about what they want to talk about.